These Spray Jets on 10-32 Threads are designed to work with PVC and risers. 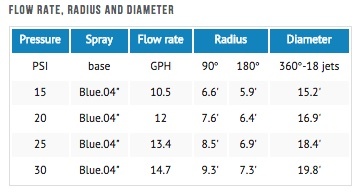 The low flow spray jets are available in full, half, and quarter circle patterns. Ideal for ground cover, flower beds and shrubs. Recommended installation is at least 6" to 8" above the ground.